The movie, as a whole, raised many people’s expectations of what could be possible in a musical that was originally written for the stage. Though many attempts were made, none were successful until this production. Who knew the woods could be so magical? Apparently director Rob Marshall (Chicago) did when he made the renowned Broadway musical, Into the Woods, come to life. With the world famous cast, he takes you on a journey, which blows you away. There is definitely magic in these woods. The collaborative effort of the cast makes watching the extras worthwhile, as they work together. Since not everyone in the cast comes from a musical background, this movie pushed a lot of limits from the actor's point of view as well the point of view of the viewer. The movie, as a whole, raised many people's expectations of what could be possible in a musical that was originally written for the stage. Though many attempts were made, none were successful until this production; and this can be attributed to Marshall and his vision. He was able to adapt them from stage to screen flawlessly. Part of what makes the movie successful is that the director did an incredible job assembling an all-star cast. He knew how he wanted the characters to be portrayed, and he found actors who could deliver. From veteran Meryl Streep (The Devil wears Prada), as the witch, to relative newcomer, Anna Kendrick (Pitch Perfect), as Cinderella, the cast delivers excellence. Emily Blunt ( The Devil Wears Prada) is a surprise as the Baker's wife and Tracey Ullman (The Tracey Ullman Show) is perfectly cast as Jack's Mother. In the Blu-ray, you get to experience the magic in the making. You are given insight as to what actually happens on such a great movie set. You see the spectacular cast work together, and work outside of their comfort zones, to create one of the best movies of the year. The Blu-ray extras show how large of a production this endeavor was, and how hard the cast and crew worked, to bring stunning visuals to the screen. The 1080p high definition video is crisp, and detailed, as the cast wanders through the elaborate woods. The 60 piece orchestra can be heard in spectacular quality with the DTS-HD Master Audio 7.1. 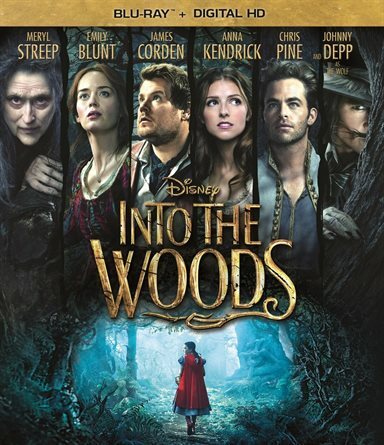 Download Into The Woods from the iTunes Store in Digial HD. For more information about Into The Woods visit the FlickDirect Movie Database.